My new army was about to be tested against yet another version of Monster of Chaos army list my most trusted sparring partner, Eastern Barbarian, decided to bring to the field. I had two games against similar list of his before so I was curious what iteration he is going to bring this time. Btw, I got the details after the game as we played with close lists. It has been quite a long time since the last game for me. I haven't played a game since CanCon so it was more than 2 months and I was really eager to play again. Time is luxury than ever these days and while one can find it here and there for posting, playing a game is a different story. The good thing I had a chance to think and discuss some changes to the army list. I was not sure which army list to use yet but I decided it is a good time to check something unusual (at least for me) as I was about to play on UB. Always a great place to test different ideas before one commits to new painting/modelling projects. Despite the lengthy discussions I made up my mind just before the game and mainly thanks to Ferny and Nicene from Ulthuan.net you can have an opportunity to see two new set ups for my characters. Quite significant changes in comparison to the army list I played with at CanCon. Although the most radical changes seem to be about characters equipment let me start with the units. I replaced Sea Guard with Silver Helms. It was not due to the fact that SG is a bad unit (although I know many think so) but to encourage more movement and combat orientated play. They are solid medium cavalry and bring some fast and relatively hard hitting elements to the list. They are not strong enough to defeat enemies on their own but thanks to good armour, S5 on the charge and re-rolls to hit they should be quite reliable. I also decreased the number of Archers and lost their banner to accommodate these changes. In the special department the most notable change is return of Shadow Warriors. I missed scouts in my army and I hope to learn how to use them properly. I also decreased the number of Swordmasters in order to make room for them. One of the great eagles was also promoted to be the mount for BSB! Bob the BSB for a very long time was a very good shooter with his Reaver Bow and Potion of Strength combination. But I wanted him to be more active and stop slowing down any unit he might be with. Nicene suggested the Eagle rider and since I have never used one I decided to try it out! We had some discussion about mounted character being exposed to cannons and spells but it seems there are no safe options and if you decide to take one then you might lose a little bit in some other areas. The most unexpected, also for me, was the last minute decision to take the Loremaster with Book of Hoeth. It is thanks to Ferny and his persistence (although others suggested many times I should include that item) that I decided to give it a try and see how much difference it can make. 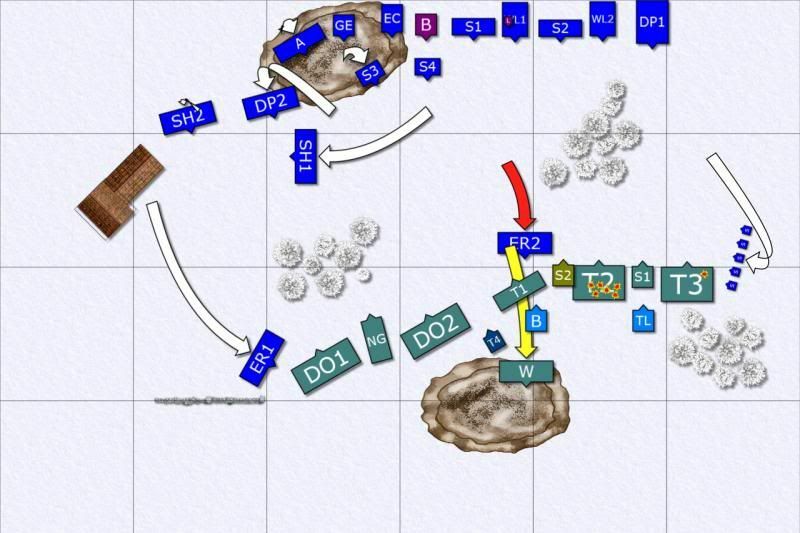 EB brought very tough and fast army where the slowest element has M6. Lots of Stomps and S5+ attacks. Bad news even for cavalry. But let's have a look at the characters and units. Chaos Lord that flies and has very good protection. 2+ armour save and 4++ ward with re-rolls of 1's mean he is one tough model to bring down. Helm of Many Eyes makes gives him ASF so he will be hitting often and hard (S7 on the charge!). As he can fly he is not going to be easily stopped. I didn't know exactly what his protection is but I assumed he is well warded so I decided I need to shoot other targets as he can absorb a lot of damage. He is good fighter but I doubt he will be committed alone. That should give me some time before he joins the combat and I can always challenge him with champions or keep him busy with other units. Despite his very good protection it is always risky to go against Swordmasters or Lions as each can inflict that crucial wound. 1+ armour save and 3++ ward make him another tough character to fight against. There is not much I can do to him at a distance if he is not exposed but well aimed searing doom can do some damage (possibly good spell for the lord too). Very fast, even despite ground movement. He needs to stay close to the trolls though (and lord too at least at some time to lead them towards the enemy) so as in the case of the lord I may have a little time before they hit my lines. And the best way to deal with him is probably by forcing a break test as he automatically dies when forced to flee. Heavy investment in Tzeentch characters probably forced EB to take only a single sorcerer but Nurgle one is very good fit for Monsters of Chaos. In particular, if he gets the spell that improves regeneration! Although some amount of flaming attacks may limit its power a little. He is also very well protected so he can go into combat along the Trolls or other units and at least absorb some damage. Very good fighter on his own, makes all the Trolls core choice. Which is scary. He alone has 5 S6 attacks but can also add his S5 breath weapon that does not allow armour saves. Very bad news for the cavalry in particular as infantry has too little armour anyway. And he can act as a leader for the beasts in the army if the general decides to hunt elsewhere. Very dangerous as they are quite flexible due to two ways they can attack you. They are good at decimating infantry with their multiple S5 attacks that can also hurt small units of cavalry. But they also can switch to puke attacks that auto hit and do not allow saves at all. Their T4 and regeneration means they are not easy to kill. Fortunately, I have some flaming attacks in the form of shooting, spells and banner of the eternal flame. But there are 3 units of them and killing them fast enough at a distance can be a problem. Only a single pack of dogs meant I didn't have many targets for arrows but even one unit can be potentially annoying and needs to be dealt with quickly. These guys are even faster and thanks to their 4w per model they can absorb some damage and still hit back hard. One unit had more attacks at S5, the other sported great weapons giving them scary S7. Although S5 is quite enough for elves anyway. 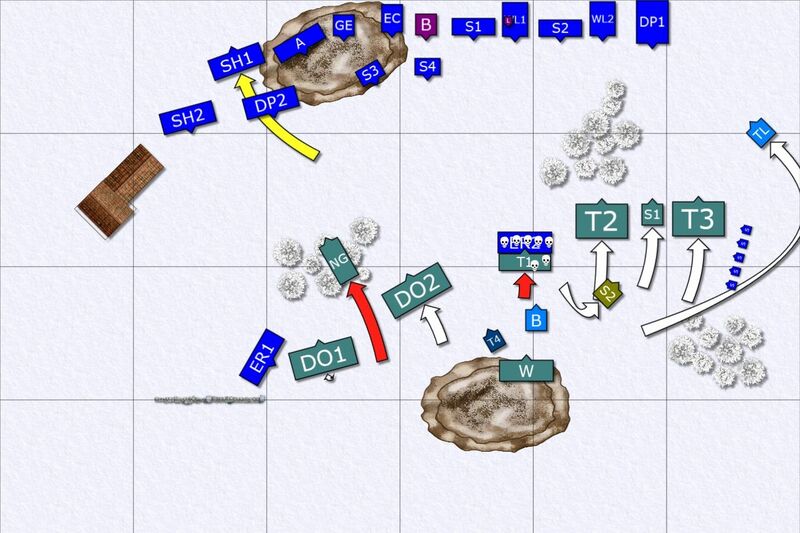 Their weakness is their narrow flank, where number of attacks is greatly reduced, as well as their average Ld7. If they happen to be out of the range of BSB and/or general they can suffer from even slightly lost combat. A little random and hard to predict but Mark of Nurgle makes him tough enough. Cannot be ignored and his Ld10 and stubbornness makes him quite annoying indeed. Potentially good target for shooting. Very hard hitting model, also due to the fact he can thunder stomp my small units to their squishy deaths. One can be dealt with but in the army where every single unit is hard to contain anyway it is very difficult task. Spells can help, such as Spirit Leach and numerous attacks can wound it still when he does not have that much of an armour to speak about (at least in comparison to other models). All in all a very tough army to deal with simply because it is fast, resilient and I need a lot to create a situation when I can deal with any single unit or character. While possible it is also way harder since they are not going to come at me alone. Because of that I decided to group elite infantry together so that they can support each other and attach dragon princes with flaming attacks to that formation. Thanks to that they can attack together and infantry will benefit from flaming attacks of faster dragon princes. I also wanted to position them at the very edge of the battle field. 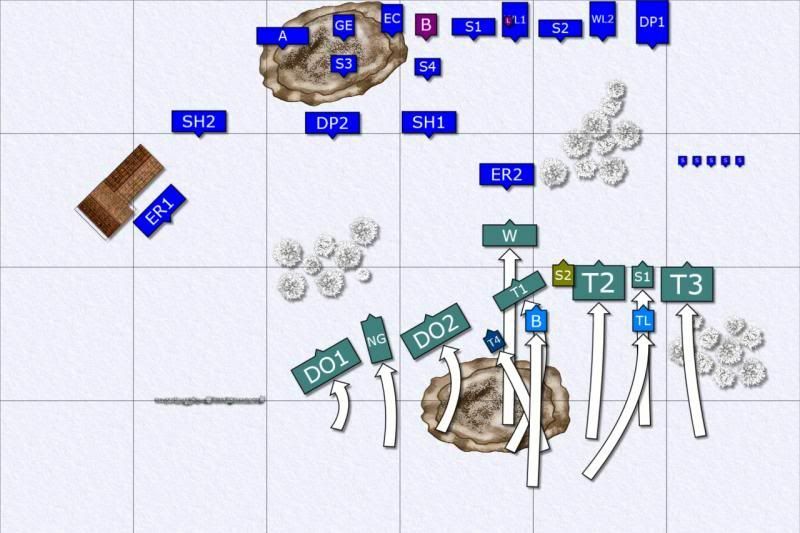 Thanks to that, even if the enemy was going to march straight at me, they would not be able to charge before turn 3. And then they might be close enough for a counter. Having two turns of magic and shooting should also help in decreasing the number of threats or at least to wound some of them and make them more vulnerable. I wanted to position cavalry close to the enemy, on the other hand, so that when they marched they would immediately be in the charge distance and I could hopefully mount some good pre-emptive strikes. 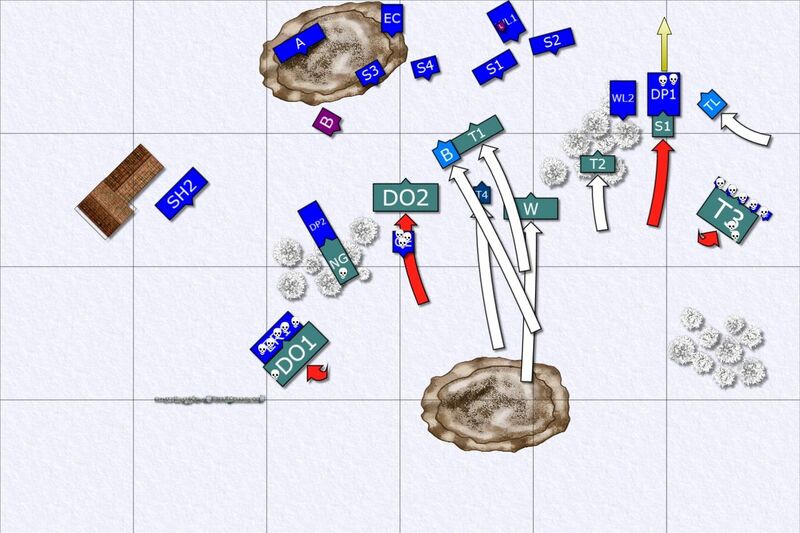 EB deployed his forces shifted towards his right flank but he could also easily wheel towards the centre or even left flank if he wanted. I was not happy with the deployment of the SH1 because somehow I decided that it is good idea to put them in the centre where they can block other regiments. Other than that all according to the plan with cavalry threatening advance towards the infantry and foot soldiers deployed at the edge of the battle field to give the army more time before the inevitable close combat. As this time I have all the details from the game, down to every single dice roll, I am going to use it to provide more information on the game flow. I will not, of course, write about everything but I believe some more specifics can be quite useful. Nurgle Sorcerer had the following spells: Rancid visitations, Fleshy abundance, Plague wind. EB won the roll off and his was the first turn. As expected entire army of Monsters rushed towards the Elven lines. EB kept his army tight and compact. Only Dragon Ogres and Giant didn't move at full speed, probably not wanting to get into safe charge distance of the cavalry. The winds of magic were not strong (3-2 after channels) and Rancid visitations were cast at SH1. However, the spell was dispelled with the aid of the Book of Hoeth. Majority of the regiments remain in place. 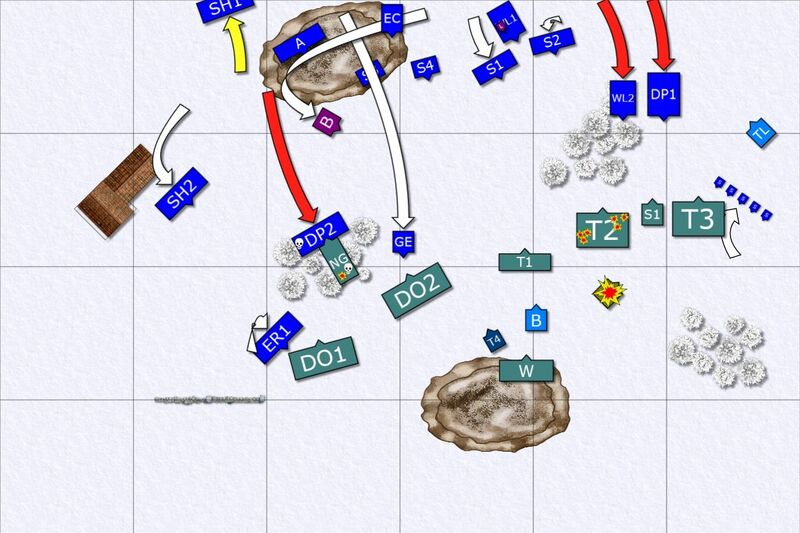 SH1 try to avoid the enemy but are in a very bad position. Reavers charge warhounds who flee and Reavers have to stop one inch away from the enemy. This time magic is strong (11-7 after channelling) that is good news for the Elves. The Loremasters casts Miasma on middle trolls to slow their advance and this spell is allowed to go through. Trolls are slowed down but only by 1". Next he tries Spirit Leach on 3 dice against Shagoth and EB uses 5 dispel dice to make sure it is not cast. A single dice is next used to cast Burning Gaze at middle trolls and the attempt is successful but again, thanks to Book of Hoeth. 4 wounds are inflicted in total but due to allocation 1 of them is saved by sorcerer's dragonbane gem. As it happened the last spell cast is medium Fireball and it is cast with 2 dice and Irresistible Force! Only 2 hits are generated and none wound. Loremaster gets hit with S6 for his trouble but I rolled a 1 to wound so nothing really happened. The feedback took away remaining power dice and the magic was over. In the shooting phase Sisters start and Archers and Bolt Thrower follow. Everybody is shooting at the middle trolls and as a result 2 are dead and one wound is inflicted on the Sorcerer. Giant charges Silver Helms who flee, fortunately not panicking anybody on the way. With no other targets giant fails his charge and ends up in the Wildwood but the trees can't harm him. Trolls charge the Reavers and kill them all. 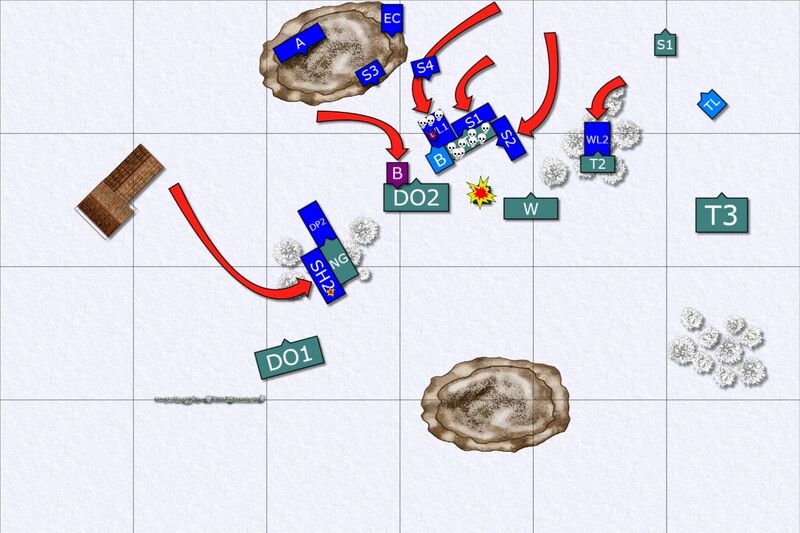 Sorcerer moves out of the regiment as otherwise they would not be able to move due to proximity of the enemy troops. Winds of magic are quite good (8-5 after channels). Fleshy abundance is allowed to be cast on Shagoth so it gets 5+ regeneration but rancid visitations cast at Shadow Warriors are dispelled. Failed attempt to counter charge! As attack is the best form of defence I charge with DP and WL against Shagoth. WL need double 6 but I decided to try it anyway. DP were 15 inches away but I had to roll 1, 2, 3 and they failed their charge too! On the other side second unit of DP charged the giant and inflicted a single wound while Wildwood hurt him this time too. It held on Ld10 stubborn roll. In the meantime I also roll double 6 for a rally test for Silver Helms and I lose them for good. Even Shadow Warriors failed their march test and I could not block Shagoth but only diverted Trolls. Dice gods were definitely playing with me! Magic was 8-6 after channels. I wanted to cast medium fireball with 2 dice but got 2 and 4. I attempted to re-roll 2 with the Book of Hoeth but got a 1 instead and that was the end of my magic phase! In the shooting I decided to keep hurting middle unit of trolls. Both units of Sisters and unit of Archers aimed at them and 2 more trolls were dead. It is worth noting that Sisters inflicted 5 wounds while Archers contributed only 1. The eagle claw aimed at wounded sorcerer and finished him. There were many charges and the Monsters moved forward fast again. Dragon Ogres killed all the Reavers on the left flank. Another unit of DO's destroyed great eagle and overrun towards the hill but had to stop just behind the trolls with BSB. On the right flank Trolls made a short work of the Shadow Warriors and Shagoth inflicted two wounds on Dragon Princes (made two 6++ wards!) who then failed their Ld7 break test. I think I made a mistake here by not checking the distance from the Loremaster as I rolled 8 and that would have helped them to stay and enable Lions to help. On the other hand Chaos Lord also failed his Stupidity Test due to Helm of Many Eyes and stumbled forward 4 inches. I spotted the opportunity to destroy some of the enemy units in the centre and establish good position for later turns when I would have to deal with the returning Shagoth and Chaos Lord. I managed to fit 3 units against trolls and enemy BSB. Lions and Swordmasters to the front and another Swordmasters to the flank. At the same time I charged Dragon Ogres with a BSB and Giant with Silver Helms. If I could break trolls and BSB then overruns would carry Lions to Dragon Ogres behind while Swordmasters would have hit Throgg. Silver Helms, if they killed the giant could have also overrun into Dragon Ogres. If all worked as I intended then BSB+Trolls, Dragon Ogres, Throgg and Giant would have been destroyed. I also charged 2 trolls in the forest with second unit of Lions to finish them off and break to the safety by avoiding attention of third group of these monsters. Magic is medium 7-4 but it gives good difference between power and dispel dice, also with the advantage of no wizard on EB side. I cast Iceshard Blizzard (again with the help of the Book) and EB uses his dice to dispel that (I guess -1Ld was the deal breaker here). With remaining dice I cast Wildform on Lions (I used 3 dice as I didn't want to risk another problem as with Fireball previously) and Miasma to lower WS on the same unit and I got -2 penalty for Trolls and BSB. Which was good because BSB was WS5 thanks to that. Everything shoots at Throgg then and the beast is dead. It was another good example where Sisters inflicted flaming wound and other units picked it up to finish otherwise very resilient character. I decided to start combat from the big one as I wanted to get rid of the BSB. He challenged but nobody accepted. After I rolled Swordmaster attacks there were no trolls anymore. White Lions fluffed their to hit rolls against BSB and lost 3 of their numbers. 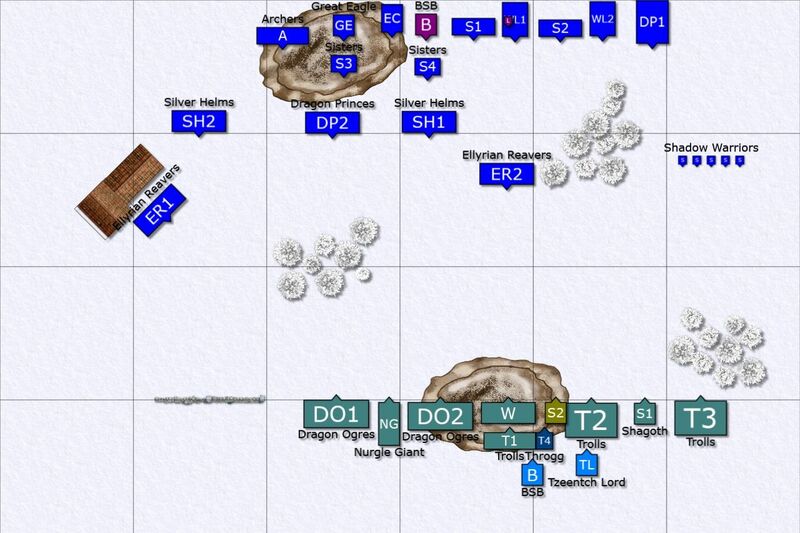 Unfortunately, as Swordmasters were out of combat, their ranks and flank didn't count anymore but EB still needed double 1 to hold. He got 1,2 on a re-roll and his BSB died. Lions and flanking Swordmasters (now having a clear path) overrun into Dragon Ogres. At this stage EB conceded as we didn't have enough time to continue anyway. He said that the only thing he could do now was to preserve some points but with 3 characters dead and his army divided the game was clearly going into HE favour and the losses were probably too big to turn the tide. Dragon Ogres were definitely in a poor situation. It was not clear yet if the giant could have stayed or not and what would have been the fate of trolls attacked by Lions. Magic supremacy of the Loremaster with the Book himself could have caused a lot of trouble. Intact shooting base was also going to hurt remaining units. And with solid centre formed from three elite infantry regiments that barely sustained any casualties it was tough job for EB to claw some points back. That was short report in terms of turns played but I hope the details I could provide this time made it no less interesting. EB was reluctant to the idea of the battle report as he was disappointed with mistakes he made but I think the write up can serve us both well for the future. Besides, there were significant changes to my previous army list and I wanted to use the opportunity to make some comments on the new one. I like the fact I have more cavalry but I didn't use them well this game. They were good at the flanks but I misplaced SH1 and lost it with no gain. Cooperation of 3 cavalry regiments on the left flank was good but probably could have been better if SH1 were there as well. I didn't really feel that my shooting phase is less powerful so I am happy with the core change but it definitely requires way better deployment and use. I was considering deploying my infantry in the same formation but on the left flank. With longer distance for the enemy to cover and cavalry on the other flank I may have had better chances to get enough time to weaken the enemy as it advances, move the units into good positions, use the building to the advantage too and have more space for cavalry to manoeuvre. I didn't feel the need for second eagle but it is probably because this game I had to sacrifice light cavalry and shadow warriors to slow down the enemy. I am not happy I had to do that with Shadow Warriors but I am not sure if there was another role for them this game. Maybe setting up double flee moves with reavers would have worked better. The shooters are still powerful but it is due to the presence of the Sisters who removed regeneration, inflicted wounds easier and allowed archers and bolt thrower to add some more wounds. The usual focusing of fire on a single target works perfectly. I doubt 30 Archers and Bolt Thrower can do the same damage. Not in the case of trolls as a target for sure. Due to lack of time I didn't have a chance to use Bob and Eddie yet but it was clear their flying movement is a huge asset. Without it that follow up charge would have been very hard to obtain as I would probably join some regiment even if he was mounted on barded steed. Of course this them I didn't have to worry about cannons and the spells were not a problem either. The Book is more powerful than I expected. I had good rolls for the winds of magic but the ability to re-roll dice was huge. Either to cast spells or to dispel some. It is not going to make the army immune to enemy spells or make sure all I cast goes through but it helps to keep the magic phase going. It happened this game a few times when I rolled low and would have ended my magic phase too early. I am sure it is no news for many players but for me the impression is that this item is way too good. I am not saying it is overpowered but making it as it is now there is no other choice in the Arcane item department. It will be very hard to leave that item at home. It really makes the Loremaster much more helpful. I think EB made a mistake with Trolls and BSB when he moved them so fast forward. Maybe he didn't expect that 3 infantry units can make it to the fight. I believe he would have done better by holding for a turn to allow the Lord to come back to his senses and team up with the Shagoth. I also don't think fleeing with warhounds was necessary. He did well with the giant as it approached through the woods but fortunately for me I had some support units to prevent his DO's to join the fight. He also suffered because he moved Throgg and Sorcerer out of their units. That allowed me to pick them up as targets, got me more efficient magic phase and quite a few victory points.